A classic teaching example in black and white film photography courses is the tomato on a bed of leaves. Without the use of a color filter, the resulting image is low-contrast and visually un-interesting. The tomato is likely to look unnaturally dark and lifeless next to similarly dark leaves; although in a color photograph the colors make for a stark contrast, in fact the intensity values of the red and green of tomato fruit and leaves are nearly the same. 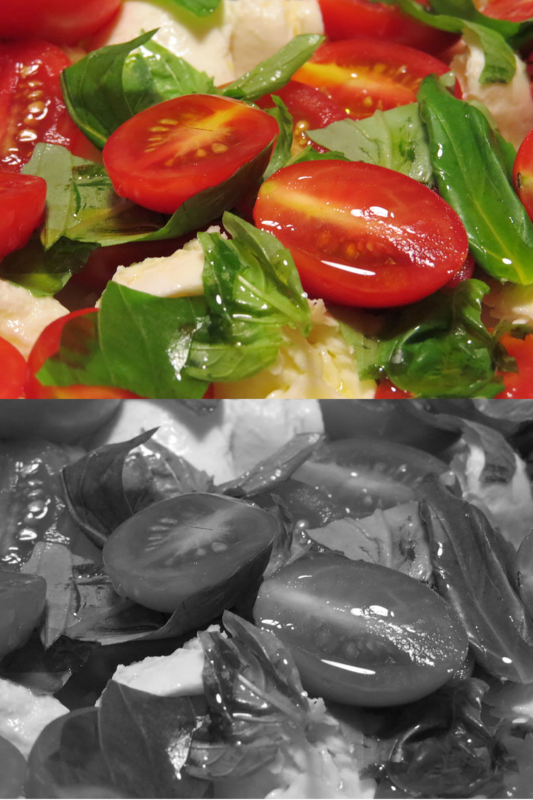 The use of a red or green filter can attenuate the intensity of one of the colors, making it possible for an eager photographer to undertake the glamorous pursuit of fine-art salad photography. The always clever cephalopods (smart enough to make honorary vertebrate status in UK scientific research) somehow manage to pull off a similar trick without the use of a photographer’s color filters. Marine biologists have been flummoxed for years by the ability of squid, cuttlefish, and octopuses* to effect exact color camouflage in complex environments, and their impressive use of color patterning in hunting and inter-species communication. The paradox is that their eyes (cephalopods, not marine biologists) only contain a single type of photoreceptor, rather than the two or more different color photoreceptors of humans and other color sensitive animals. Berkeley/Harvard duo Stubbs & Son have put forth a plausible explanation for the age-old paradox of color camouflage in color-blind cephalopods. They posit that cephalopods use chromatic aberration and a unique pupil shape to distinguish colors. With a wide, w-shaped pupil, cephalopods potentially retain much of the color blurring of different wavelengths of light. Chromatic aberration is nothing more than color-dependent defocus, and by focusing through the different colors it is theoretically possible for the many-limbed head-foots to use their aberrated eyes as an effective spectrophotometer, using a different eye length to sharply focus each color. A cuttlefish may distinguish tomato and lettuce in a very different way than a black and white film camera or human eyes. A cuttlefish might focus each wavelength sequentially to discern color. In the example above, each image represents preferential focus for red, green, and blue from top to bottom. By comparing each image to every other image, the cephalopod could learn to distinguish the colorful expressions of their friends, foes, and environment. Much like our own visual system automatically filters and categorizes objects in a field of view before we know it, much of this perception likely occurs at the level of “pre-processing,” before the animal is acutely aware of how they are seeing. A view of the reef. There are distinct advantages to this type of vision in specialized contexts. Using only one type of photoreceptor, light sensitivity is increased compared to the same eye with multiple types of photoreceptors (ever notice how human color acuity falls off at night?) Mixed colors would look distinctly different, and, potentially, individual pure wavelength could be more accurately distinguished. In human vision we can’t tell the difference between an individual wavelength and a mix of colors that happen to excite our color photoreceptors in the same proportions as the pure color, but a cuttlefish might be able to resolve these differences. On the other hand, the odd w-shaped pupil of cephalopods retains more imaging aberrations in than a circular pupil (check out the dependence of aberrations on the pupil radius in the corresponding Zernike polynomials to understand why). As a result, cephalopods would have slightly worse vision in some conditions as compared to humans with the same eye size. Mainly those conditions consist of living on land. Human eye underwater are not well-suited to the higher refractive index of water as compared to air. We would also probably need to incorporate some sort of lens hood (e.g. something like a brimmed hat) to deal with the strong gradient of light formed from light absorption in the water, another function of the w-shaped cephalopod pupil. Studying the sensory lives of other organisms provides insight into how they might think, illuminating our own vision and nature of thought by contrast. We may still be a long ways off from understanding how it feels to instantly change the color and texture of one’s skin, but humans have just opened a small aperture into the minds of cuttlefish to increase our understanding of the nature of thought and experience. Ever image is formed by smearing light from a scene according to the Point Spread Function (PSF) of the imaging system. This is a consequence of the wave nature of light and the origins of the diffraction limit. In Fourier optics, the point spread function is the absolute value squared of the pupil function. To generate the PSF, I thresholded and dilated this image of a common cuttlefish eye (public domain from Wikipedia user FireFly5), before taking the Fourier transform and squaring the result. To generate the images and video mentioned above, I added differential defocus (using the Zernike polynomial for defocus) to each color channel and cycled through the result three monochromatic images. I used ImageJ and octave for image processing. In particular, defocus pseudocolor vision would make for interesting perceptions of mixed wavelengths. Observe the color disks above (especially the edges) in trichromatic and defocus pseudo-color. The aperture used to calculate chromatic defocus. Any idea what’s up with this one? It’s eyes look like they’ve been painted on! Nice video. How did you approach the vision simulation? Next Next post: A skeptic over coffee: who owns you your data?